The objective of the Hawthorn Table was to create a useful design that was subtle in appearance. The materials used were lightweight yet sturdy with a mixture of different materials that compliment each other and add to the overall aesthetic of the design. Using such a thin material for part of the structure made it challenging to figure out how the legs would attach to the aluminum piece. The first idea was a strong adhesive, but it was important to stay clear of any harmful materials in the design. There was some trial and error with the prototype but in the end the decision was made to solder a plate to the base of the table and legs. Another challenge was distributing the weight of the materials properly so that it would stand up without falling to one side. The weight of the wood was quite a bit heavier than the aluminum so it was important to make sure that the aluminum side took up more space than the wood side. The wood shelf had originally been designed to be 2” thick, but was then reduced to 1” to help with weight distribution. The wood shelf is made of a solid walnut so there are no harmful glues that would otherwise be used in a veneer process, as well the wood is treated with a non toxic and non synthetic linseed oil. The aluminum magazine holder is treated through the process of powder coating. Powder coatings contain no solvents and they release little to no VOC’s. 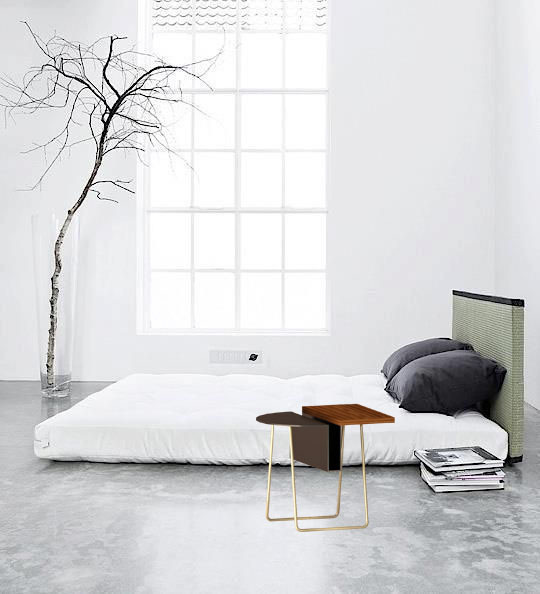 The legs are made of solid brass tubing and are untreated. Legs are made from 1/2” diameter brass hollow tube, the magazine shelf is 15 gauge aluminum, powder coated matte black and the shelf is a 1” thick solid walnut with linseed oil finish. The wood piece is cut, sanded and treated with 3 coats of linseed oil. The brass legs are cut and bent using a heat torch and the aluminum is bent in a sheet metal bending vice. The aluminum is then powder coated matte black. The brass legs are soldered to a brass plate, which is then soldered to the base of the aluminum shelf using a multi metal solder. The brass plate has 4 holes on the legs that will be attached to the wood shelf. The plate and legs are then screwed into the wood shelf. Our fixture system is designed to contain a small collection of home and furnishing products that are curated and displayed in an attractive, organized fashion. The fixture system contains a thin white polycarbonate floor with a discrete grid pattern, a main white polycarbonate wall with the “Target” logo and red-framed screen on the back, as well as 2 additional polycarbonate walls with a shelving option, available in white or clear for additional sightlines. Cubed platforms in 2 sizes are placed on top of the grid system to host a variety of products. 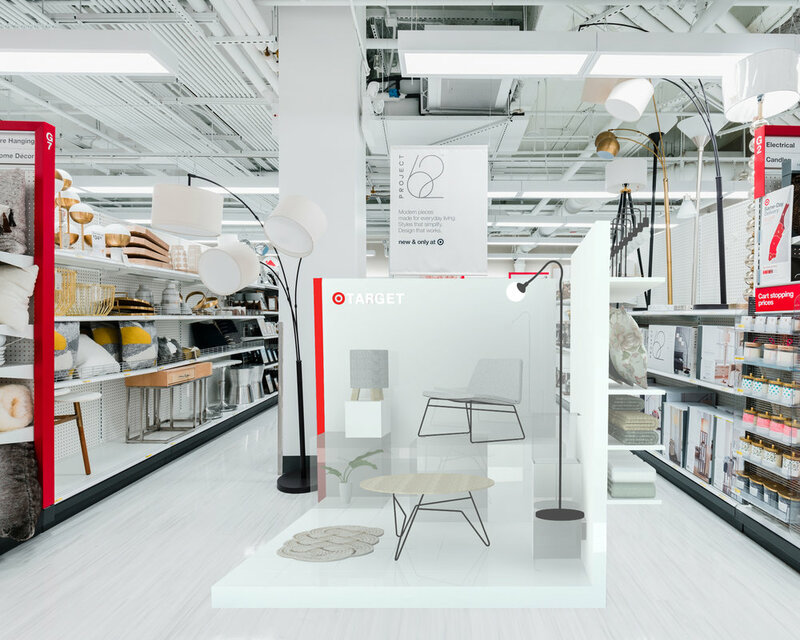 Customers will experience the fixture system as a curated collection contained within a vignette of walls, but will be able to step within the walls to engage with the products displayed. Overall, this fixture solution provides the customer with a beautifully curated collection in the physical space, as well as additional options for merchandise available online through the digital interface. It has a clean, simple, organized aesthetic that can be used across multiple product ranges.